Are people ‘coming back off the sidelines’ and into the workforce, as Ivanka Trump says? Touting the Trump administration’s economic achievements and celebrating the six-month anniversary of the tax cut, Ivanka Trump boldly pointed to people “coming back off the sidelines” as evidence of success. Setting aside that it is far too early to claim credit for broad economic trends, Trump’s choice of supporting evidence — the labor participation rate and number of food stamp recipients — is odd. These rates are influenced by changing demographics and long-term trends, not just the administration’s policies or short-term economic gains. There are two ways that “people who have been out of the workforce” can “come back off the sidelines.” One is to join the labor force. The other is to gain employment. These are not the same. In this case, it appears Ivanka Trump is referencing the labor force, not employment — which has been declining for more than a decade. Generally speaking, the labor force participation rate measures non-institutionalized civilians ages 16 and older who were either employed or actively looking for a job. But Trump specifically refers to “prime-age men and women.” If we look only at the participation rates of prime-age adults between the ages of 25 and 54, workforce participation has increased slightly, 0.2 percent between May 2017 and May 2018. Burtless pointed to the increase in the employment-to-population ratio among adults 25 to 54, which measures how much of the adult population is employed. It is 0.8 percent higher than a year ago. Like the labor force participation rate, it’s not a hugely fast increase. But it’s improving faster because there is a decline in unemployment. Trump then pointed to “2 million people” who “have come off food stamps” (an accurate statistic) as evidence of the economy’s strength, noting that they were “starting to reenter the economy.” Experts say that’s debatable. To start with, 65 percent of people receiving food stamps or benefits from the Supplemental Nutrition Assistance Program (SNAP) are children, elderly adults or non-elderly adults with disabilities — groups that are not part of the labor force. In fiscal year 2016, which spanned the Trump and Obama administrations, only 8.8 percent of SNAP participants were non-disabled adults between the ages of 18 and 49 in households where children were not present. In other words, the vast majority of the people on food stamps aren’t working. So, are 2 million people coming off food stamps because the economy has improved? The exact reason for this decline is still unclear, but Elaine Waxman, a senior fellow in the Income and Benefits Policy Center at the Urban Institute, pointed to several possible forces for the decline. For one, the economy could be helping — the recipient or someone in their household could have become employed or they could be earning more. It’s also possible that nothing in their economic situation changed. Instead, they no longer qualify for SNAP because several states have rolled back recession-era waivers that allowed some adults to keep benefits for longer periods of time without employment. Reports have also suggested that immigrant families with citizen children have dropped out of the program for fear of the administration’s immigration policies. We asked the White House for additional information, but it did not respond. Trump is straddling the line. Labor force participation among prime-age workers has been increasing, but not by “large” amounts, as she claims. It has been steadily, slowly climbing since well before Trump took office. Plus, experts argue that labor force participation has more to do with demographic trends than an individual administration’s policy — especially one that hasn’t even reached the halfway mark of its first term. Furthermore, a stronger job market is probably one factor in the people coming off food stamps, but it is certainly not a metric to prove that adults are reentering the economy. The majority of SNAP recipients are children, elderly or disabled. Of the adults who do not have a disability, recent policy changes mean they may no longer qualify for food stamps, which doesn’t equate to reentering the workforce. Trump is using accurate data to draw faulty conclusions. People may be “coming back off the sidelines,” but the evidence she cites is not proof. 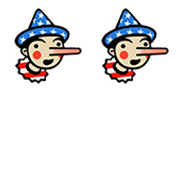 She earns Two Pinocchios. Can’t see the Poll?Click Here.